When you start making photographic images, you need to have a way to store them. If you start selling or giving away your images, you need to have a way to present them. There are many storage options for non-stereo slides made on 35mm film. When you start discussing mounted stereo slides, or medium format slides, there are many fewer options. I use two different sized slide mounts for my medium format images. 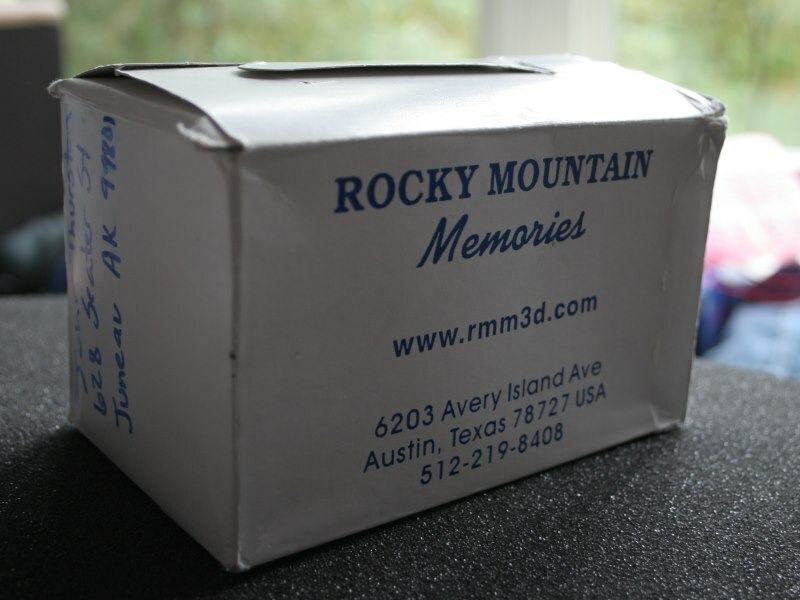 The cardboard mounts from Rocky Mountain Memories and 3D-Stereo are 80mx132mm. The plastic mounts from 3D World in China are 80mmx140mm. 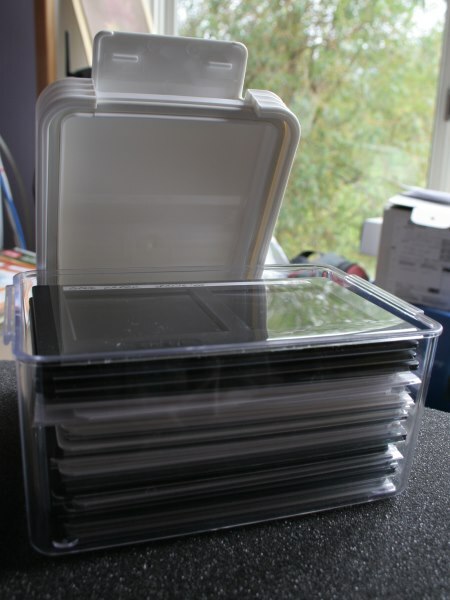 For a while, I tried storing my images in the boxes my empty mounts had come in. The slides fit well but were impossible to see without removing them from the box and it was very easy to accidentally leave thumb prints on the slides while pulling them from the box for review. Putting the slides in protective sleeves prevented fingerprints on the film but made the slides a bit taller and they no longer fit well in the boxes. Ultimately I found that boxes really weren’t made for continual handling and they didn’t last very long. 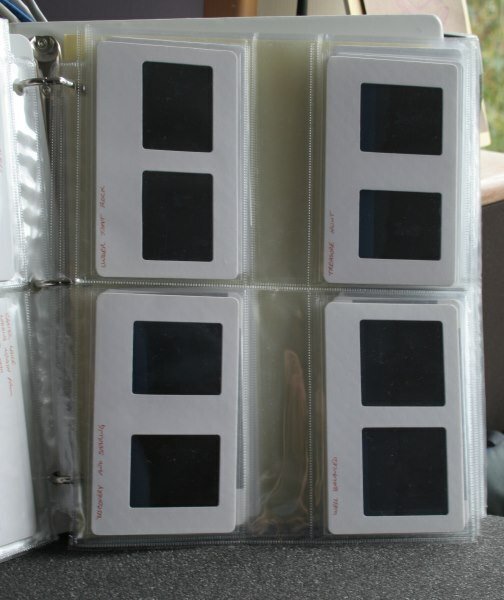 I then tried storing my mounted slides in plastic envelope pages in three ring binders. I found a page from 20th Century Plastics which let me put four slides on a page. This made it easy to flip through to locate the image I wanted without fingerprinting all the slides. But the pockets didn’t hold the slides very securely and the slides somtimes dropped out while I was turning pages. I also found pages tended to sag in the binders which made me afraid this might lead to deformed slides. I then found some very nice “ClickClack” plastic boxes from New Zealand. They were strong, dust proof, stacking and transparent. My slides fit nicely with their protective sleeves and the boxes were good looking. Unfortunately, they cost about $8 each and I couldn’t buy them locally which meant expensive freight costs. So when (October, 2007) Peter Thomson of Australia announced he would be having some cardboard storage boxes made for 80×140 mounts, I was immediately interested. Peter actually carried through with his project and by March, 2008 he was able to announce the boxes were available for purchase. I ordered a box of boxes from him and settled back to await delivery. The most ecomonical way to send a box from Australia to Alaska is by Sea Mail which turned out to require about three months to arrive. They did eventually arrive in excellent condition and I was pleased to see the results of Peter’s work. The boxes are of stiff cardboard, 85x148x40mm (HWD) with a blue textured exterior and a smooth white interior. Each box is designed to snugly hold ten 80x140mm mounts and, with its overlapping top in place, makes a very secure package. I have also found they will comfortably hold fifteen of my 80×132 cardboard mounts.
. . . I have found them to be generally very good but some are a little tighter thn I had specified. The manufacturer believes they must have shrunk a little during shipment . . . I have found the best way to stretch the length is to insert ten assembled empty mounts plus a piece of cardboard of cereal box thickness, overnight. They are then completely satisfactory. I have yet to run across this problem. Maybe the boxes have expanded a bit in the Southeast Alaskan rain forest and are closer to their original size. Maybe I just haven’t used enough to find any which have shrunk. What I have noticed is the boxes aren’t well suited for use with slides in protective sleeves. The extra thickness of the sleeves prevents fitting ten slides in a box (which isn’t a very big deal). The more significant problem is the extra height of the sleeves prevents correctly seating the overlapping box top. This leaves a 5mm gap around the box and a package much less secure than it should be. In fairness to Peter, it should be noted that the boxes were specifcally designed for un-sleeved slides and I was aware of this when I ordered mine. I can see two ways around this. One would be to have the boxes made 5mm taller with a 5mm spacer in the bottom. When loaded with sleeved slides, the spacer could be removed. Another approach would be to have a lid made which was 5mm taller than the current one. 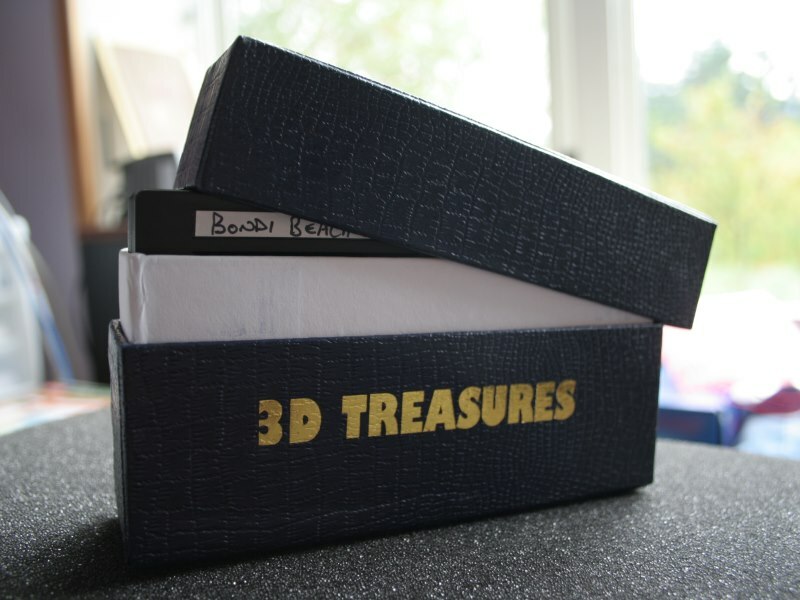 As currently designed, Peter Thomson’s 3D Treasures storage boxes are an excellent choice for storing unsleeved slides. They aren’t ideal for sleeved slides, but they are certainly more durable than my original cardboard boxes, more secure than binder-pages and less expensive than my plastic boxes. I have enough to cover my needs for several years and don’t plan on giving up any of them. If you’d like some, contact Peter by email at p.tho1181@bigpond.com to see if he has more.